As a kid, I never had a SEGA Genesis. I was a SNES man, myself. Most of the time, I was fine with that, as the SNES had more games that interested me at the time. But there were a few times when a game on the Genesis caught my eye. 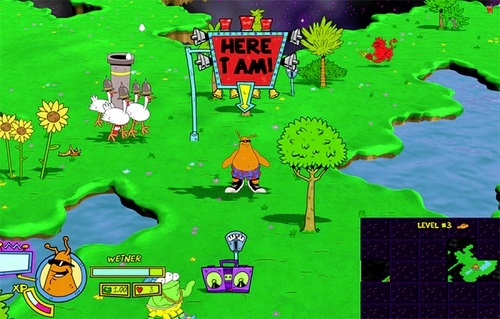 ToeJam & Earl was one of those games, as it was very colorful and cartoony with unique gameplay. Over the years they’ve had a few sequels, and now they’re back again with ToeJam & Earl: Back in the Groove. It’s a homage to the original game on the Genesis, and it’s available to download on nearly all current game consoles and PC, but reviewed on PS4 here. In the game, two hip hop rapping aliens, ToeJam and Earl, are taking a joyride with their lady friends Lewanda and Latisha in their spaceship. They travel to Earth so they can crank up their tunes, but Earl accidentally presses the wrong button and causes a black hole to appear, sucking them and the Earth inside. Now the four aliens must explore the Earth, which is now a bunch of little islands floating out in space, find the parts of their spaceship, and fix the Earth back to normal. It’s a little hard to describe the game unless you’ve already played the one on the Genesis. If you have, then all you need to know is this one plays exactly like the first game, just with gussied up graphics and new modern day features. There are a few new aspects, like dark levels where you use a flashlight to see, or snow covered ice levels, but otherwise it’s exactly the same. But if you haven’t played a ToeJam & Earl game before, the best way to describe it is that it’s a cleverly disguised randomly generated dungeon crawler. You first pick one of the four characters. You can play by yourself or with a friend in co-op either via couch multiplayer or online. You’ll explore 25 floors searching for pieces of your spaceship. On each floor you’ll have to find the elevator to the next area, and they’ll let you know if there is a piece there, too. Watch out for crazy Earthlings who can take out your health meter and other status effects. Not all humans are bad, though. Some just slow you down, while others can help you. Be on the lookout for money, food, and presents. Presents have random power-ups when you open them, but watch out because sometimes they can have bad things hidden inside, too. Find all the spaceship parts to win the game, but if you lose all your lives, it’s Game Over. As you perform actions, you’ll gain experience. When you have enough, find the wise man in the carrot costume (yes this game is weird) to level up your stats. You can play a ‘fixed’ version of the game where all the floors are the same every time, or you can unlock a random mode where the areas will be different each time you play. There are bonus areas where you can earn extra items. These include rhythm dance-offs, and a 2-D bonus stage that pays homage to the Genesis sequel: Panic on Funkotron. The game is very polished, too, with a detailed in-game instruction booklet that’s very informative and fun to read, and even a tutorial world that explains things by letting you play. If you liked the original game, you’ll love this one. Me personally, I’ve always wanted to like the ToeJam & Earl games so bad, but all you do is walk around most of the time, and it gets pretty hard and seems to rely a lot on luck. So I’ve had a tough time getting into the series because of that. But it doesn’t mean it’s a bad game. So if you’re a fan or just want to give the series a try, you can’t go wrong with this one. ToeJam & Earl: Back in the Groove is rated E-10 with ESRB descriptors of Crude Humor and Mild Cartoon Violence. You can eat nasty food that’ll make your character barf, and there are fart attacks, too. Most of the time you just try to avoid Earthlings, so the game is pretty non-violent most of the time. You can get a slingshot to shoot tomatoes, though, but that’s about as violent as it gets. Reading skill is helpful for some of the text, and younger games may find it a bit too difficult at the Normal setting. Luckily you can set the game’s difficulty at easier levels, and that’s something that all ToeJam & Earl games have done, so that’s pretty cool. I think ToeJam & Earl would make a neat cartoon, don’t you? as i wish for enjoyment, as this this web page conations in fact nice funny information too. Tired of typing this out each time? Register as a subscriber!